Hiya everyone! I hope everyone has had a great weekend! I know i posted a summer makeup look but i change my makeup looks almost everyday and recently ive been using a lot less products becuase the heat has gotten to me so much, so ive decided to post the look im creating a lot recently. Its a very clean and simple look with no eye makeup and minimal products that every girl probably has! So becuase ive got a brush belt full of different brushes, it can be hard to pick the brushes i want to use everyday but i autoatically seem to go to these few brushes so i thought id share them all with you! 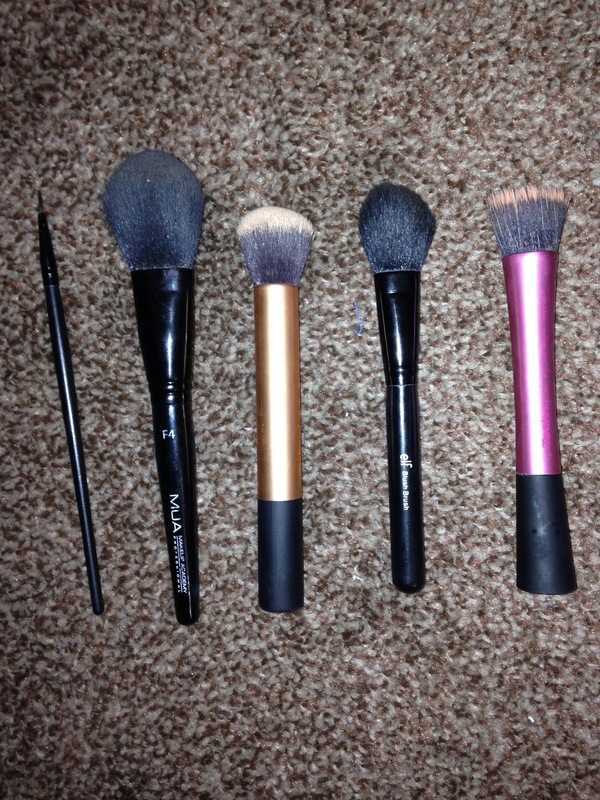 from left to right: The first one is just a long bristled eye liner brush i got in a set a few years back, i use this on a daily basis because i think that the long bristled one is a lot eaiser to control along the lash line. The second brush is an MUA Academy F4 brush, i use this for all sorts such as powdering under my eyes and as an all over face brush. The gold handled brush is a Real Techniques buffing brush, i use this to buff in my foundation into my skin. The fourth brush is from elf, its labelled as a blush brush, but i dont really like it as a blush brush, as it has a more angeled edge, i use it as a contour brush as it fits right into the cheek bone and the bristles are ultra soft! The last brush with the pink handle is also a Real Techique brush, a stippling brush (Real Technique brushes are my fave!) 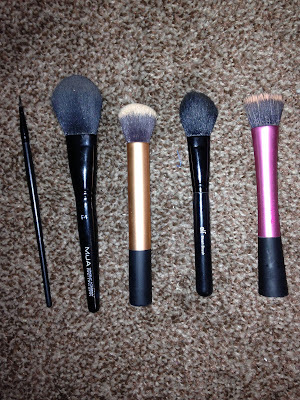 this brush is so easy to blend any product into your face with, I love it! The products above are all of my face products for my everyday look, I try not to use a lot of products as its so hot! 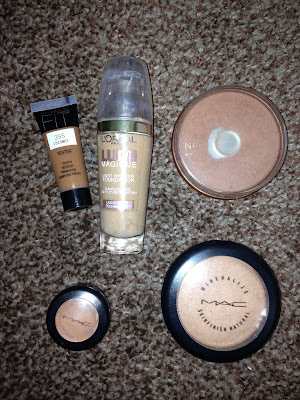 From left to right: Maybelline FIT me foundation in 355 coconut, L'Oreal Lumi magique foundation in sun tan, Maybelline natural bronzer in 022 sun bronze, MAC studio finish concealer in NW30, MAC Mineralize skinfinish in Medium/ Dark. For my eye makeup, i dont use a lot as i try to save my eye proucts for clients but the proucts i do use as gel liner and mascara. from left to right: collection gel eye liner in black, Avon super extend extreme mascara. The first step when doing my makeup (after moisterising) is that i countour. I do this before putting on my foundation because for me, if i do it the other way around it tends to look heavy on my face and caked on. I use Maybelline fit me foundation to coutour as it stays on all day and its a great foundation! I first place it in my cheek bones then whats left on the brush on my temple and my jawline. This helps create the illusion of a higher cheekbone.I then use a concealer brush to place it down the bridge on my nose starting from my brow bone to slim my nose. I then use my MAC studio finish concealer under my eyes in a triangle shape, on the bridge of my nose and on my chin to conceal blemishes. After blending in my contour, i then use half a pump on my Real Techniques buffing brush and place in on the outter sides on my face and blend in into my face and my contour. This for me, creates a flawless face and conceals any blemishes and redness i may have. To finish off my makeup i set it all with my MAC mineralize skin finish. This product sets my foundation and bronzer and makes it last all day! 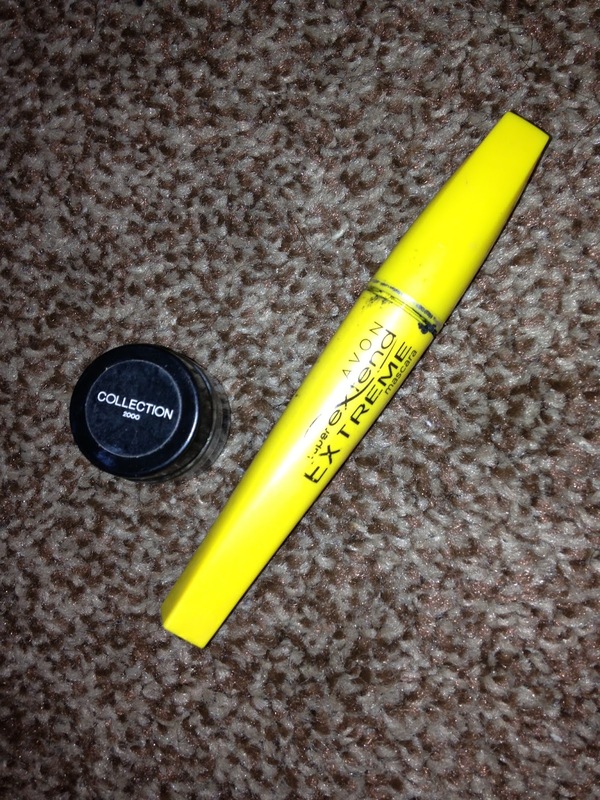 Its definitely one of my favourite products and so easy to carry it in my bag!